Traditional Afternoon Tea is a gracious formal affair in the Tea Room at the Kempinski Hotel Moika 22 in St. Petersburg, Russia. Imagine a cold, early November, late afternoon in St. Petersburg, Russia with snowflakes swirling gently in the sky. 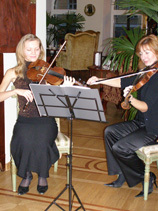 The strains of violin music waft into the lobby of the Kempinski Hotel Moika 22 from the Tea Room, where there is a crackling fire inviting guests to come in, warm up by the fire, and partake in a gracious ritual of Afternoon Tea. Edward F. Nesta and I had spent the day at the Hermitage and shopping in St. Petersburg in November 2006, and by the time that we returned to the hotel, we were chilled and more than ready to relax near the fire and enjoy a pot of tea. The Tea Room at the Kempinski Hotel Moika 22 provided the perfect respite to warm our bodies and nourish our spirits in a most gracious ambience. 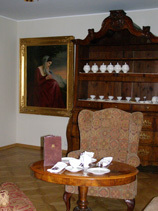 The Tea Room is an attractive room filled with antiques and a fine collection of paintings from the hotel owner's personal collection. Elegant round and oval tables decorated with white china with comfortable high-backed wing chairs upholstered in red and gold fabric welcome guests. A fire roared in the fireplace gently perfuming the air, there was a painting hanging over the mantel, tall white tapers burned in silver candelabras, an antique ornamental screen graced one wall of the room, and potted palm trees added to the elegant ambience. To complete the mood, a violin duo played classic music throughout the afternoon. 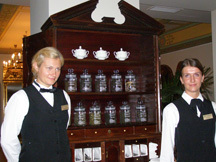 The Tea Room menu has an excellent selection of teas including: Breakfast Royal, and Darjeeling Testa Valley. Black tea varieties include Ceylon Kenilworth, Assam Testa Valley, Autumn Blend made with figs, grapes, nuts, and raisins, Vanille tea. Black Bergamot tea includes, Earl Gray, Pouchkine with citrus aroma and Bergamot, C'est Une Belle Histoire a black tea made with figs, bergamot, lemon, cherries, flowers of lotus and cornflower. Green tea varieties include: Japan Sencha, Vert Jasmine, and The des Courtisanes made with green tea from China and Japan, with blackberries, bilberries, tangerines, and vanilla. For fruit tisane fans, they offer Feu de Chemine, a fruit infusion made with hibiscus petals, hips, apple, dried orange peel, and cinnamon. The Tea Room does not forget coffee aficionados, and offers a nice selection of coffees from Kenya, Ethiopia, Guatemala, Costa Rica, as well as espresso. There were lovely traditional large fruited scones served with jam and cream, a tempting assortment of savory finger sandwiches including cheese and cherry tomato, cucumber and mint, tuna and olives, pecans and Philadelphia cream cheese, chicken curry and pineapple, and egg salad. 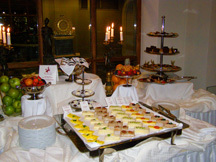 A silver multi-tiered stand was laden with lusciously decadent pastries including an assortment of fruit, lemon, and pecan caramel tarts, white and dark chocolate truffles, cakes, muffins, and a chocolate cake that was over-the-top rich and decidedly fabulous. Having Afternoon Tea at the Tea Room was a delightful way to experience an important part of Russian culture. Traditional Afternoon Tea is served each afternoon from 3:00 pm - 6:00 pm. Read other articles on the Kempinski Hotel Moika 22 in the Hotels and Resorts, Restaurants, and Chefs' Recipes sections.